Repose Inflatable Static Travel Mattress Overlay. The Repose Mattress Overlay is an inflatable static overlay mattress, that is incredibly versatile and totally portable and comes supplied with its own, very easy to use pump that allows the mattress to be inflated and ready for use in seconds. The Repose Mattress offers excellent support for the user and its clever design provides effective and even pressure distribution giving clinically proven effectiveness in the prevention of pressure ulcers and making it suitable for use with all users at risk of developing pressure ulcers, including those assessed as very high risk. The mattresses combination of two multi-stretch high-tech urethane membranes provide this excellent pressure distribution and have a vapour permeable surface, helping to prevent perspiration and further improving user comfort. 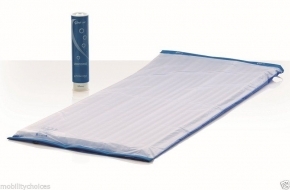 The Repose Mattress Overlay, which is latex free and very easy to clean, is supplied securely packed inside its own unique pump, which enables it to be inflated to the correct pressure automatically and ready for use in seconds. The mattress is fitted with an elasticated strap that ensures it remains firmly in place when in use on either a single or a double bed. The Repose contains no exposed metal or electrical elements allowing it to be used during CPR if required. Purchased this to use on holiday in a couple of weeks time and after trying it out on my bed last night I am pleased to say that I found it very comfortable and and no problems with my sore hips. The packaging is very compact although I had to roll it a few times to release the air so it would fit into the tube. This is an ingenious idea as it is the pump as well.I shall test it out for my 3 week holiday and will report if it does not perform as it did last night. I have every confidence it will.